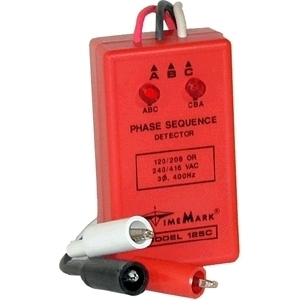 The Model 108B and Model 125C (400 Hz) Phase Sequence Detectors permit the operator to quickly and easily determine proper phase sequence (either ABC or CBA). 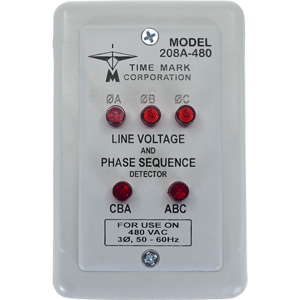 This can be vitally important information when installing, or making wiring changes to motors, wattmeters, transformers, electrical installations, power factor meters or generators. 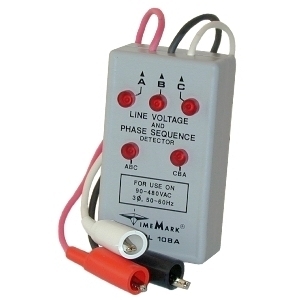 To use, connect the Detector to any 3-phase circuit from 208 to 480 volts, Wye or Delta. Proper phase sequence and all phases present will illuminate the ABC lamp and the three voltage lamps. An open phase condition will illuminate both lamps. If two or more phases are open, neither lamp will illuminate.